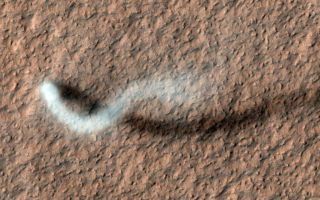 A towering dust devil, casts a serpentine shadow over the Martian surface in this image acquired by the High Resolution Imaging Science Experiment (HiRISE) camera on NASA's Mars Reconnaissance Orbiter. A towering dust devil, casts a serpentine shadow over the Martian surface in this space wallaper acquired by the High Resolution Imaging Science Experiment (HiRISE) camera on NASA's Mars Reconnaissance Orbiter. The length of the dusty whirlwind's shadow indicates that the dust plume reaches more than half a mile (800 meters) in height. The plume is about 30 yards or meters in diameter.